Science Project _ How does temperature affect the strength or adherence of glue? the strength or adherence of glue? Natural and synthetic glues with many different compositions are used in many products. The ease of use and the strength of glue makes it a perfect and inexpensive choice for fastening different materials. With growing use of glue in different products it becomes necessary to study the safety, reliability and the strength of different glue in different temperatures. 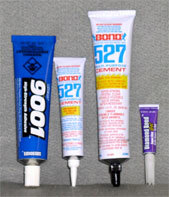 After all glues are polymers (like plastics) and polymers are often sensitive to the heat. Heat can melt, soften, decompose and deform many polymers. How does heat affect glue? Is it possible that glued parts will come apart if they get warm or hot? How strong are glues at different temperatures? In this project you will study the effect of heat on one specific glue of your choice. You will design experiments to see how heat affects the strength of glue. You will finally present your results in the form of tables and graphs. More details or support on this project is available for the members of ScienceProject.com. Material needed for experiment may be found at home, obtained locally or purchased online.